He came back at 7 a.m.
What trouble, but I don’t mind! The female protagonist in this song tells a tale about finding her man — in the Portuguese lyrics, literally her “piece” (pedaço) — drunk in the avenue during Carnaval in Rio de Janeiro. The song was released in 1939, and the protagonist mentions two Carnaval hits from that year, “Florisbela” and “Jardineira.” The mention of those songs — along with Rio’s Carnaval landmarks: Largo da Lapa, the Avenue (Rio Branco) and the Gallery (Cruzeiro) — bring the story to life. The reco-reco is a noisemaker, played by scraping a stick over notches in the hollow instrument (pictured below). 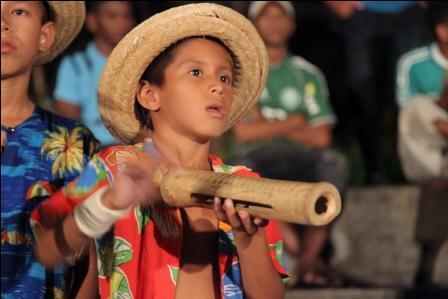 The rope mentioned in the song is the rope used to cordon off Carnaval parades. 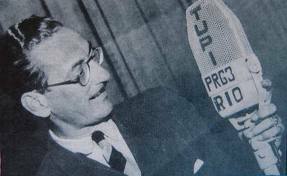 Araci de Almeida released the song in 1939, and in 1956, Ary Barroso recorded it himself, unfazed by its feminine voice. Ary Barroso (1903 – 1964) is widely considered the greatest master of Brazilian popular music, alongside Pixinguinha. Born in Ubá, Minas Gerais, his mother and father both died when he was just eight years old, and he went into his maternal grandmother’s care. He began playing piano and first appeared in public at age 12, in Ubá’s cinema Ideal. When he was seventeen, an uncle died and left him an inheritance, which he used to go to Rio de Janeiro. He began law school, but ran out of money after the first two years, and started playing piano around Rio de Janeiro to support himself. 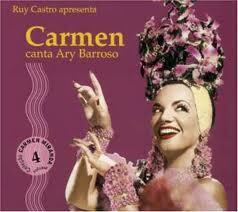 Carmen Miranda incorporated many of Barroso’s songs into her repertoire. Ary had written his first song, “De longe,” at age 15, and shortly after, “Ubaenses Carnavalescos,” and he began to write more during his years in Rio. He was hired by the maestro Sebastião Cirino to play in Cirino’s orchestra, and made enough money to go back to law school in 1926. In 1929, Ary finished law school and had his first hit song: “Vamos deixar de intimidade,” recorded by his friend and classmate Mário Reis. The same year, he entered and won first place in Casa Edison‘s contest for Carnaval songs with “Dá Nela,” and used the prize money to marry Ivone Belforte de Arantes. Ary’s international fame grew with his soundtrack for Walt Disney’s movie The Three Caballeros (in Brazil, entitled Você já foi a Bahia? ), and he spent much of 1944 in the United States, where he composed the theme song to Three Little Girls in Blue. Preoccupied with keeping samba “authentic,” Ary was a vocal critic of bossa nova and its “American chords.” Nonetheless, João Gilberto made a hit – a second time around – of Ary’s song “É luxo só” when he sang it bossa-nova style on his debut album, Chega de saudade. Ary Barroso died of liver cirrhosis in February, 1964, during the Carnaval in which Império Serrano paid tribute to him with the samba “Aquarela brasileira.” Since his death, his songs have been rerecorded by many of Brazil’s best-loved voices, including Gal Costa, Elis Regina, Paulinho da Viola, Caetano Veloso, Chico Buarque, and Tom Jobim. Que perigo, mas não ligo!